TechnicBRICKs: TBs TechPoll 07 (Results) - PF u/S-Motor, which size? 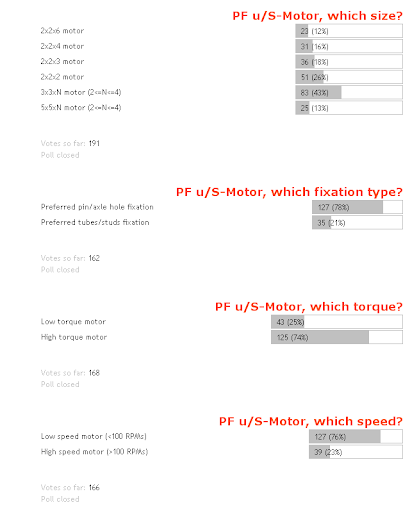 TBs TechPoll 07 (Results) - PF u/S-Motor, which size? One more TBs poll, came to the end! The Power Functions System (PFS), is a very actual topic and a promising one in terms of LEGO innovation for the years to come. So it is natural, the fans expectation regarding possible future elements adding to the PFS. The introduction of an eventual small sized minimotor (S-Motor) and/or a micromotor (u-Motor), that somehow "replaces" the old LEGO micromotor and also easily integrates with the new system possibilities, is one of these highly anticipated expectations. During two weeks, nearly 200 TBs readers participated into this poll and gave their opinion about, which characteristics they would find more valuable in such a motor. The results may be seen on the poll closing status snapshot below. In terms of size and maybe with some surprise, most readers selected a 3x3x3 sized motor against the other good candidate with 2x2xN size (which got a reasonable percentage of votes, anyway). Of course we can't decouple this result from feasibility of other reader's preferred motor characteristics, like speed and torque. However it seems the preference for such form factor, relates mainly with the inconveniences an even width motor would represent in terms of integration with the actual studless dominant TECHNIC system, which essentially odd. PF u/S-Motor, which fixation type? Despite there is a chance that LEGO may see a 'u/S-Motor' closer to SYSTEM applications than TECHNIC, of course TECHNIC fans (presumably most TBs readers) are looking into this issue from their TECHNIC builder perspective. So the vast majority prefer to get a pin based connectible element, rather than a stud/tube based. a) increase length to accommodate front pinholes like in M-Motor, and/or rear spacing for transversal or longitudinal pinholes or even a transversal axle hole through end (pin connectivity allowed here too). b) decrease inner width available for the motor or internal gearings and apply half deep side pinholes to use with 3/4 pins or full pins and thin beams, at both front and/or rear ends. All these, would allow for very versatile motor connectivity options, however sacrificing a bit, the motor size and/or the performance. Another idea as an interface to fix such small motors (mainly, the 2-wide variant), could be to use the same fixation type as used in the Linear Actuator (LA). It wouldn't help to keep motor the smallest possible, as it needs 1L (plus another 1L protruding beam) just for the fixing structure which could hardly be used for other motor internals like gear reduction. But it gives some extra flexibility in terms of connectivity. Then, existing LA brackets would be usable for fixing the motor to different types of structures and applications. Connectivity to the actual LAs wouldn't be straight forward, but nothing which couldn't be solved by using two 61905 in a back-to-back setup, or any new shorter bracket combining both. A screw type plastic head (with some locking capability) to fix new brackets, would be also a possibility, but probably it is out of LEGO parts design principles and rules. Depending on the motor form factor chosen and connectivity interface, it could be also developed some kind of adapter, to make it stud friendly for SYSTEM applications. Once more we got the specific wish from the TECHNIC builders in large majority, which require an high torque motor. Clearly it shows, their intended applications for this motor, won't be turning radar dishes into a SYSTEM MOC or similar. Here the largest preference, goes for a low speed motor. Probably the most consensual option, between TECHNIC and SYSTEM builders. In my personal perspective and from a functional point-of-view, there is space in the PF motors range and possible applications, for several extra motors like those on the list below. Of course, there must be a profitable business case and official LEGO sets needing them in quantity, to justify each one. u-Motor (2x2x2) - If two different adapters would be made available, it could fit both SYSTEM and TECHNIC applications. For the TECHNIC builders, one of its most natural applications could be a direct drive for the new Linear Actuators, avoiding complex and space consuming transmissions (just an electrical PF cable, would remain to be routed). Very useful for this application, even if that means the motor should become longer (2x2x3 ou 2x2x4 sized), because of torque requirements. But doubt on it, as LAs are low torque devices and probably their internal clutch will actuate first. This is in my perspective, the main driver for a 2-wide PF motor within TECHNIC building. LAs are also 2-wide and both would make a perfect fit in terms of aesthetics, at machinery lifting arms/booms, where space is always not in excess. S-Motor (3x3x3) - Medium/Low power in a compact form factor, for space efficient/restricted designs. Apart from size, it would distinguish itself from the u-Motor version above, mostly by the options available for fixing it. L-Motor (5x5x2 or 5x5x3) - Medium/Medium-High power motor, where available space is a problem lengthwise, but there is enough room for a 5-wide motor.